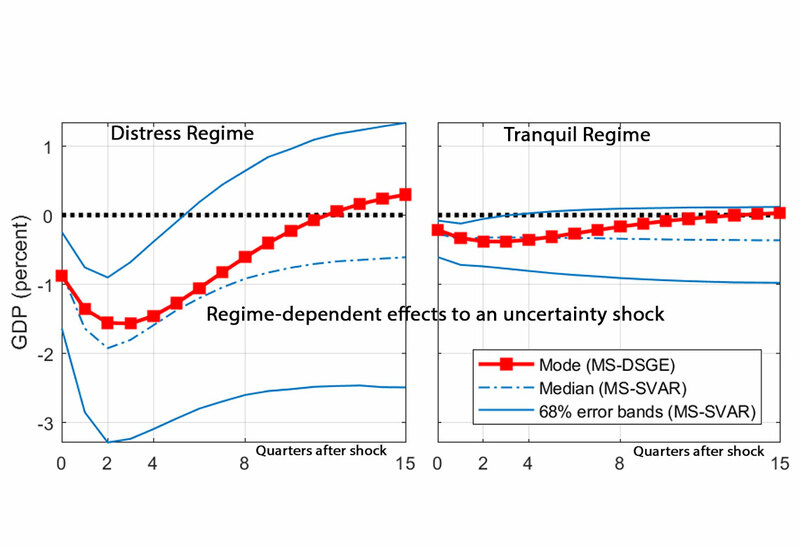 Using a Markov-switching VAR, we show that the effects of uncertainty shocks on output are four times higher in a regime of economic distress than in a tranquil regime. We then provide a structural interpretation of these facts. To do so, we develop a business cycle model, in which agents are aware of the possibility of regime changes when forming expectations. The model is estimated using a Bayesian minimum distance estimator that minimizes, over the set of structural parameters, the distance between the regime-switching VAR-based impulse response functions and those implied by the model. Our results point to changes in the degree of financial frictions. We discuss the implications of this structural interpretation and show that the expectation effect of regime switching in financial conditions is an important component of the financial accelerator mechanism. If agents hold pessimistic expectations about future financial conditions, then shocks are amplified and transmitted more rapidly to the economy. It has been well documented that higher uncertainty reduces aggregate activity, leading to higher unemployment and lower investment and output. Recent empirical studies have also emphasized highly nonlinear effects, depending on the state of the economy; adverse effects of uncertainty shocks are greater in distress periods than in tranquil periods. However, little is known about the structural factors in accounting for these changes as inference of nonlinear relationships presents econometric challenges within a quantitative general equilibrium framework. The objective of this paper is to fill part of this gap by exploring, through a novel econometric estimation, potential changes in the underlying structure of the economy that could explain such a nonlinearity. Disentangling the causes is important for understanding the extent to which economic activity can respond to future uncertainty shocks as well as the role that policy can play in order to mitigate those adverse effects. We first reproduce the empirical evidence of highly nonlinear effects within a Markov-switching Structural Vector Autoregression (MS-SVAR) framework. We use U.S. quarterly data and include GDP growth, a measure of uncertainty (i.e., the VIX index), and a credit spread. The model identifies two distinct regimes. The first was seen in nearly all the years of episodes of high inflationary pressure in the 1970s and 1980s, during serious turbulence that marked 2001-2003 period, and during the global financial crisis. The second covers periods of tranquility. We show that, under the first regime, the adverse output effects of an increase in uncertainty appear to be four times higher than under the second regime. We then focus on the potential explanations for this regime-dependent evidence by estimating, via a Bayesian minimum distance estimator, the key macroeconomic and financial parameters of a Markov-switching Dynamic Stochastic General Equilibrium (MS-DSGE) model with financial frictions, as in Bernanke, Gertler, and Gilchrist (1999) and uncertainty shocks along the line of Christiano, Motto, and Rostagno (2014). Our estimates imply that the differences in impulse responses across regimes result mainly from changes in the degree of financial frictions. In particular, lenders pay a much higher monitoring cost in the distress regime than in the tranquil regime, implying therefore a more powerful financial accelerator; i.e., linkages between the quality of borrowers' balance sheets and their access to external finance are strengthened. It then becomes straightforward to understand why the response of the economy to uncertainty shocks differs across regimes. When uncertainty rises, banks protect themselves by raising the interest rate charged on loans to firms (i.e., external finance premium), as there are more low-productivity firms --- and also more high-productivity firms, but this does not benefit to banks --- and thus more default risks. It follows a decline in demand for capital, and so in investment spending and economic activity. In distress periods, the premium becomes much more sensitive to changes in the firm's balance sheet, causing firms to make larger cut to their investment projects, and therefore, implying a larger and longer-lasting decline in economic activity.